Cruel Summer is a dark British thriller that is realistic in it's portrayal of real world horror. I found this quite hard to watch as rather than monsters and psychos you have a scenario that plays out that seems like it could have happened. This movie is based on true events, but reading more into it, it is an amalgamation of different real life crimes rather than being based on one story. 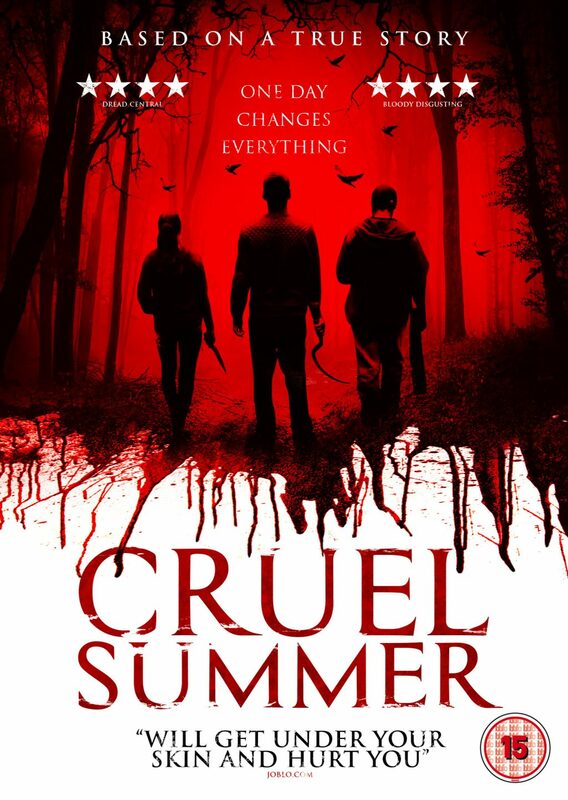 Cruel Summer is a nasty film that I wouldn't remotely class as feel good, it deals with both good and bad people, but there is no justice within the film, that is left to a pre-credit text sequence that explains what happened after the film had ended. It is a very tension filled piece thanks to the method used to show the events. The prologue edits together several scenes from later on in the film, you get a close up of a very bloodied Danny, you get a camera following someones legs sprinting through a forest, a close up of a sharp looking sickle, then shots of random scenery. These all combine to give a fuzzy look into the future, so when events start to play out you know for certain some of the horror to come. The editing in general is neatly done, I loved how some of the scenes were shot, one of the trio hanging out at a park really gave them a semblance of being a gang. Half the film follows innocent Danny going on his trip to the woods. We get to see his loving, wonderful parents, his unique way he acts within the world, and we get to see him at his happiest. The other side of the film is the polar opposite following the dark paths of his three hunters. All three of the group are chavs who find no issue whatsoever in shop lifting, underage drinking, and making a general nuisance of themselves. The leader Nicholas is permanently furious, ready to insult his friends for the slightest thing, he rules the group by fear, being stronger and more aggressive than the other two. Like them he is really quite stupid, physical violence is the only way he can think of to get out some of the anguish of being dumped. Julia is the gossip of the group, it is her who starts all the trouble, cleverly she is shown to be in love with Nicholas, this gives her a plausible incentive to go along with his crazy plan, yet the fear she also has for him means she is too much of a coward to do anything but follow him sheep like. Lastly is city boy Calvin whose biggest fault is how gullible he is falling for the other two's lies about Danny. At least this third character actually tries to stand up for his beliefs, even if this ends up mostly being done in a self preserving way. I had no issue with any of these actors, they were all great in their roles, even if their roles (especially that of Nicholas) did fall into that of a caricature at times. With such a simple story it was just a case of following events until the two plots joined up. As such I felt sick to my stomach constantly, forever hoping the two wouldn't meet, yet knowing they would, and that the results would likely be traumatic to see. It's one thing to watch a traditional horror where people are being stalked by ghosts or invincible mad men, but to see a more realistic take made everything all the more horrible. When there is the need for it the special effects were effective, a lot of what happens occurs just off screen, but sound effects help to paint a picture. The blood effects are well done, subtle but you still see plenty of spilt claret. The soundtrack is also well suited, while not the highest quality at times it fits the tone well and never seemed at odds with what was happening.